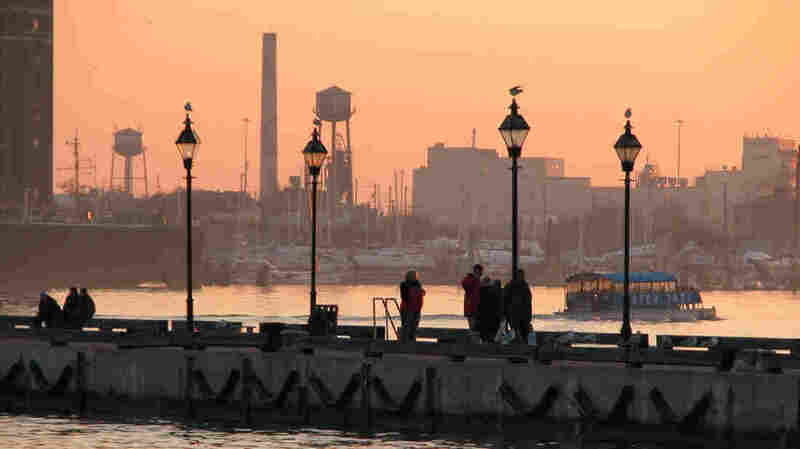 Laura Lippman's Baltimore: Loving a Flawed Place From the Antique Man's giant ball of string in Fells Point, to the crab cake lunch downtown, Laura Lippman loves Baltimore. Despite the city's crime and other problems, the crime novelist says its flaws are what make it an interesting place. Third of a four-part series. 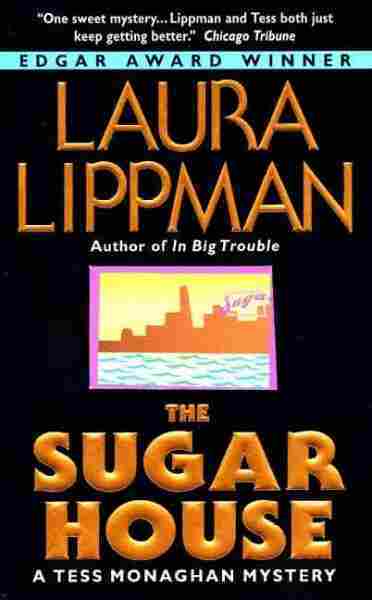 Like her leading character, Tess Monaghan, Baltimore writer Laura Lippman is a former newspaper reporter. 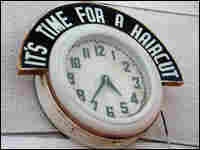 This former barbershop clock is a familiar fixture in the Tess Monaghan mysteries. 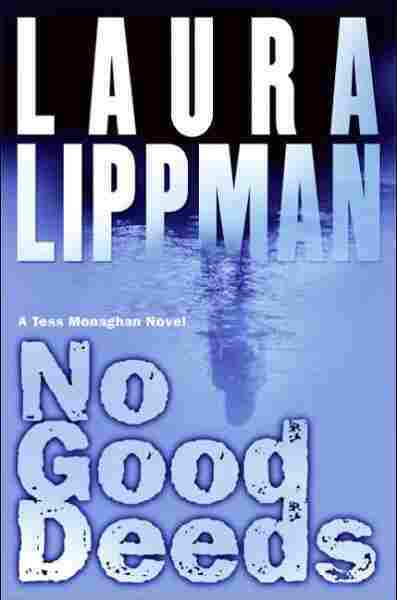 Laura Lippman writes mostly about private investigator Tess Monaghan. Monaghan is a made-up name and what she does is a matter of fiction. 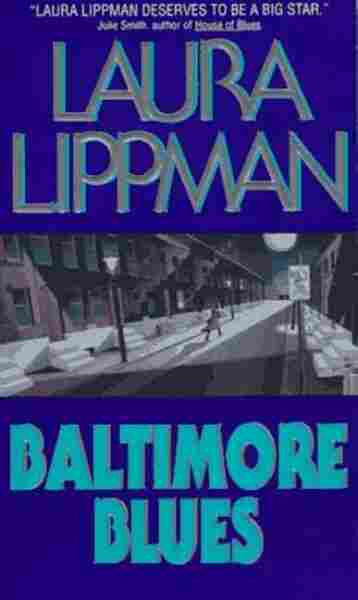 But when Lippman puts Baltimore on the page, she's got to get it right. 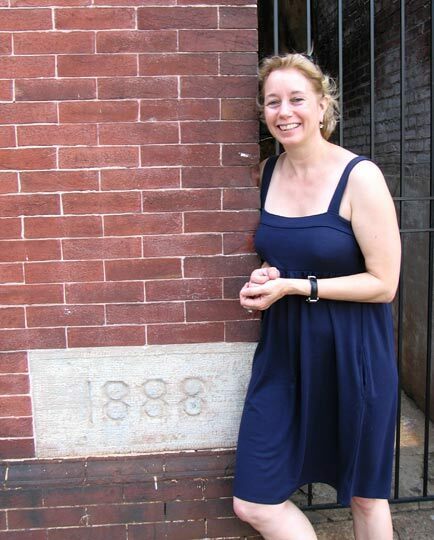 Lippman is so focused on the authenticity of the place that she often gets into a dispute with her editors over whether to spell row house (Baltimore is well-known for the narrow brick structures) as one or two words. On a rainy August day, Lippman gives a visiting reporter a tour of her city, starting in Fells Point, where the fictional Monaghan used to live in a row house above her aunt's bookstore. It's also where Bob Gerber, known as the Antique Man, shows off the 800-pound "Haussner's ball of string." The ball consists of thousands of pieces of twine — napkin ties from the former Haussner's Restaurant, a place Lippman fondly remembers from her childhood. Gerber might even give away the ball of string someday, but it's got to stay in Baltimore, he says. He's seen too much of the city disappear — and change. Asked about the pistol he wears, Gerber says, "It's a great neighborhood, but it's still bad. Baltimore City is in bad shape and myself, I've had problems in this store. I have guys run in, walk in. They're just looking for something easy to catch and I'm too old to fight them so I figure if I've got a gun, I've got a fighting chance." Lippman's next stop: the old Lexington Market downtown, where she grabs a lunch of crab cakes and beer. The Baltimore markets are favorite Tess Monaghan meeting places. The day's final excursion is along an interstate highway that comes to a sudden end. In a book, Monaghan calls this "the ghost road." I-70 was supposed to go through Baltimore to the waterfront. But the highway ends at a West Baltimore's park once known as a place to dump bodies. 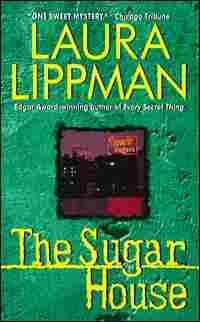 Lippman, a former newspaper reporter and now a crime writer, pays attention to the dead-body stories. One afternoon each week, she volunteers at a soup kitchen. A young girl she got to know there was fatally stabbed. People walk in who've been pistol-whipped for their paychecks. This is the Baltimore she decided to write about — not the teased hairdos and diners and the long-gone Baltimore Colts. "I think Baltimore suffers from nostalgia and it keeps us from being honest in talking about what really happened here," Lippman says. "A place doesn't have to be perfect to be beloved, and I love this city and I love it better for seeing its flaws. Anyone can love a perfect place. Loving Baltimore takes some resilience." Laura Lippman wrote the following essay about her leading character, Tess Monaghan, at the request of the Mysterious Bookshop in New York. "I chose to write a profile of Tess as Laura Lippman might have written a feature story for the local newspaper," the author says. Tess Monaghan has been called Baltimore's best-known private detective, Baltimore's hungriest private detective and, just once, Baltimore's most eligible private detective. (Her father went behind her back and entered her into Baltimore magazine's annual feature on the city's "hot" singles.) But although her work and its consequences have often been featured in the news, Monaghan, a former reporter, has been surprisingly successful at keeping information about herself out of the public domain, At least, until now. Oh yes, Ms. Monaghan, this reporter knows her way around public documents. Monaghan was born in St. Agnes Hospital and while official documents disagree on the year, she's undeniably a member of Generation X or Y, a post-boomer born to an unlikely duo who prove the old adage that opposites attract. Patrick Monaghan, described by his daughter as the world's most taciturn Irishman, was the oldest of seven children. He grew up in a crowded South Baltimore rowhouse and, later, the Charles Village area. Meanwhile, Judith Weinstein was the youngest of five from a well-to-do Northwest Baltimore family. She was just entering college when her father's eponymous drugstore chain entered a messy and devastating bankruptcy. Monaghan and Weinstein met via local politics, during the 1966 governor's race. The couple remained active in politics; Monaghan remembers riding her tricycle around the old Stonewall Democratic Club as a 5-year-old. Her father worked for years as a city liquor inspector, then began running his own club, the Point, which has thrived in an unlikely location on Franklintown Road. Her mother works for the National Security Agency and says she cannot divulge what she does. "I'm pretty sure she's a secretary," Monaghan says, "but for all I know she's a jet-setting spy who manages to get home by 5:30 every night and put supper on the table." The family settled in Ten Hills on the city's west side and Monaghan attended public schools, graduating from Western High School's prestigious A-course and then attending Washington College in Chestertown, where she majored in English. By her testimony, she discovered two lifelong influences on the Eastern Shore – rowing and Whitney Talbot. A member of a very old, very rich and very connected Valley family, Talbot has a work ethic as fierce as the one instilled in Monaghan by her middle-class parents, and the two have long reveled in their competitive friendship. Upon graduation, Monaghan joined theStar as a general assignments reporter, while Talbot – who had transferred to Yale and majored in Japanese – landed a job on the Beacon-Light's editorial pages. But Monaghan's timing turned out to be less than felicitous – the Star folded before she was 26, and the Beacon-Light declined to hire her. Cast adrift, she relied on the kindness of family members to help her make ends meet on her meager freelance salary. She lived in a cheap apartment above her aunt's bookstore in Fells Point and relied on her uncle to throw her assignments for various state agencies. It was in Kitty Monaghan's store, Women and Children First, that she met her current boyfriend, Edward "Crow" Ransome. When she was 29, she fell into PI work and likes to call herself the "accidental detective," a riff on Anne Tyler's The Accidental Tourist. "Does anyone plan to become a private detective?" Monaghan asks. "It's not a rhetorical question. I suppose somewhere, there's a little boy or girl dreaming of life as an investigator, but everyone I know seems to have done some other kind of work first. Lawyer, cop. All I know is I did a favor for a friend, botched it royally, and then tried to help his lawyer get him out of the mess I created. When it was over, the lawyer pressed me to work for him as an investigator, then pushed me out of the nest and all but forced me to open my own agency." That lawyer, Tyner Gray, would end up marrying Tess's Aunt Kitty. Monaghan pretends to be horrified by this development, but seems to have genuine affection for the man who has mentored her since she was in her late twenties. Her agency, Keys Investigation Inc., is technically co-owned by Edward Keys, a retired Baltimore police detective who seems to spend most of his time in Fenwick Island, Delaware. (Asked to comment for this story, Keys declined repeatedly and would not respond to rumors that he has, in fact, met Monaghan in the flesh only once.) Monaghan appears to be the sole employee on the premises of the one-time dry cleaners that serves as her office, although she jokes that there are two part-time workers "who have agreed to accept their compensation in dog biscuits." Those would be Esskay, a retired racing greyhound named for her love of Baltimore's best-known sausage, and Miata, a docile Doberman with infallible instincts about people. "If she had growled at you, I wouldn't have let you over the threshold," Monaghan says. "I've learned the hard way to trust Miata." The office is filled with Baltimore-bilia – the old "Time for a Haircut" clock from a Woodlawn barbershop and several Esskay tins. "People give them to me," Monaghan says. "I'm not prone to collecting things." Has anyone ever commented on the irony that Monaghan, who sits beneath that "Time for a Haircut" clock, once had a most untimely haircut, in which a serial killer sliced off her signature braid? Monaghan shot the man in self-defense, but not before he killed a former transportation cop with whom she was working. "I don't talk about that," she says. "I understand you have to ask about it. I was a reporter, and I'd have asked about it, too. But it's something I never discuss." Okay, so life and death have been shot down as topics. What would she prefer to talk about? "Do you think the Orioles are ever going to get it together? One World Series in my lifetime. It's so depressing." Note: These excerpts contain language that some readers may find offensive. "It was almost ten before Tess set out for Locust Point. Funny – she saw the neighborhood every day, from across the water, rowed her Alden along its ragged shore, yet all she really knew of Locust Point was Fort McHenry and the Domino Sugars sign, which she could see from the makeshift terrace outside her bedroom. She tried to remember to look at it every night, just before bed. So much had changed in Baltimore, it was reassuring to go to sleep with that static neon vision blazing red in her mind's eye. As a child, she thought God might be lurking behind the sign, because if she were God, that was where she would make her heaven. Atop a neon sign, overlooking Baltimore, guarding a mountain of sugar. On a map, Locust Point looked cramped and narrow. Yet once Tess crossed Key Highway, there was a feeling of expansiveness, as if the sky were deeper here, the city miles away. She had heard rumors of yuppies, drawn by inexpensive rowhouses with water views, but there was little evidence of such an invasion. Even with the big employers disappearing – Procter & Gamble, the shipping jobs – the neighborhood was strikingly unchanged. One could imagine Locust Point inside a plastic globe, synthetic snow sifting down, no one ever getting in. And no one ever getting out. From The Sugar House, published in 2000.